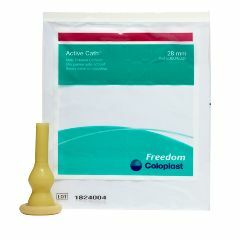 AllegroMedical.com presents The Active Cath Male External Catheter is a self-adhering, 1-piece latex catheter for active men who want extended wear. Combines a comfortable shortened latex sheath with a wide, watertight seal. Reservoir bulb prevents backflow of urine. Not for extended wear. Easily slide out if wet. Glue sticking to thighs. After having been used the Freedom Clear product line for the past 6 years, I decided to try the Active Caths again. Now I remember why I stopped using them in the first place. Because the Active cath is latex, it tends to slip off the connector tube when wet on the inside, which makes it really not for active wear, unless you really jam that hose in. Also, it tends to roll back to itself because the sheath is not glued all the way, causing the cath to peel off by itself after 24 hours. That makes extended wear impossible. Last thing is that the glue on the sheath is stuck to my thighs because it is exposed when the sheath rolls back. This is very annoying.